One of the issues of practice that we discussed in CEP 812 was the concept of digital citizenship. Copyright infringement is a huge issue with our students, especially when the the internet allows access to a vast sea of information. It’s not so much that our students are maliciously trying to “cheat” on class assignments, it’s that google > scan > copy/paste has become the digital age equivalent of finding the sentence in the book that answers the low-bloom’s recall question. In addition to providing students with tasks that require higher order thinking, I thought it would help to address the idea of fair-use. Understanding the difference between plagiarism, fair-use/remix, and original works is a good baseline skill for students who want to create derivative works. Below is a lesson I designed to illustrate the concept of fair-use through the lens of political parody. This lesson is designed to prepare students for creating their own creative works by teaching them about copyright and fair use policy. This lesson should be given toward the start of a term as it is an ideological framework that should be applied to all published works. The ultimate goal of this lesson is to help the student identify the difference between what is acceptable and not-acceptable use of a copyrighted work. With the completion of this lesson the student will be able to identify the four factors that the courts use to determine fair use (Section 107 of the Copyright Act). The student will be able to apply these four factors to their own creative process to ensure that their work stays within fair use guidelines. Students will be given the task of creating their own derivative work (political parody) in groups, using parts of one or multiple copyrighted works. The derivative work must conform to fair use guidelines as laid out by Section 107 of the Copyright Act. Each group’s political parody will be shown publicly (either in class or online) and will be up for review by teachers and students alike. Students will be graded on the quality of their work as well as their ability to work cooperatively with their group members on this project. This lesson is utilizes inquiry based, as well as Constructionist learning strategies. The first three learning activities deal with the former, the last activity is strongly rooted in the latter. There are visual, textual, and hands on elements that cater to different learning styles. One class period will be required to address the Anticipatory Set, Fair Use FAQ, and Fair Use in Political Parody sections. Three to Four class periods will be required for the Putting Fair Use to Use section. After students have been given time to respond on their own, the teacher will use these questions as a basis for classroom discussion. Students will share their own responses to the class aloud and the teacher should record the ideas into an aggregate format (traditional whiteboard chart, wiki, students tweet idea with common #hashtag, etc) that will be displayed for all students to see. After the aggregate information is displayed, ask students this question to the class as a whole: “Is A Fair(y) Use Tale a violation of copyright or does it fall into the category of fair use?” Student responses will vary. They may bring up the categories mentioned in the Fair Use section of the video, but the video is not very detailed nor insightful on this subject. The question is designed to structure student thinking as they read the Fair Use FAQ in the next activity. What are the Four Factors that help to determine fair use? What has been recognized as fair use by courts in the past? Using the Four Factors and past court decisions, determine as a group if A Fair(y) Use Tale violates Disney’s Copyright or if it is acceptable fair use. Be sure to address all four factors of fair use. In the political forum, Copyright and Fair Use issues are very prevalent. News agencies use video clips, text, and images from one another constantly. This can raise a serious issue: When a media agency uses another agency’s work, when is it fair use and when is it a copyright violation? 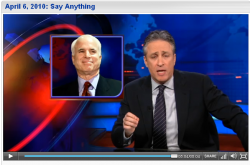 Political Parody programs such as The Daily Show and The Colbert Report, base much of their programing around providing commentary around original news clips from news agencies. This “remix” culture provides us with an excellent learning opportunity to explore the limits of Fair use. Further reinforce in students how to identify the four factors of fair use. Prepare students to create their own political parody that align with fair use guidelines. Using the Say Anything political parody (Or similar substitute) as their guide, students will create their own Political Parody’s. The teacher may select current issues for each group to address, the teacher may have students write proposals for their own group subject, or perhaps some other method may be used to assign the topic. As with much of this lesson, it is imperative that the subject matter be both relevant to current class discussion & also take into account current world events. The parody should be in video format, utilizing parts of copyrighted works (news clips, television shows, images, etc) in conjunction with original video that students will create themselves. Students will be required to draft a storyboard for their parody using PowerPoint. Groups must submit their storyboards and get the approval of the Teacher before creating their actual video. The groups will utilize a Flip Video Recorder for filming their original content, as well as Adobe Premiere (or open source alternative) for editing purposes. When completed, all the parody’s can be shown to the class. The teacher may choose to show the videos using in-class time, or post the videos to a private and secure site to use as an online resource. If the teacher chooses to use in-class time, a discussion should follow each video. Primarily to discuss how the video adheres to Fair Use policy. If the resources are posted online, students should have the ability/ be required to leave comments on their peer’s work.